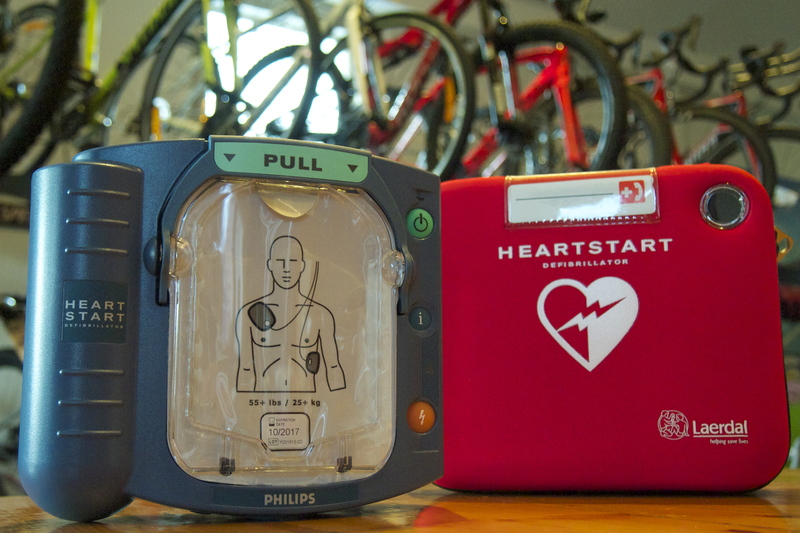 The Eureka Veterans Cycling Club have received the wonderful gift of a defibrillator from the St John Ambulance – Heart Start Community Project. The Heart Start Community Project is aimed at getting defibrillators out into the community. The project is part of the St John Ambulance Victoria Defibs Save Lives initiative and during September 2015, over $80,000 worth of defib bundles have been distributed to central Victorian not-for-profit organisations and sporting clubs. 30 defibrillator bundles have been gifted to clubs and organisations from towns such as Ballarat, Bendigo, Geelong, Maryborough, Kyneton and many more. Along with the defibrillator, each bundle includes online training available for up to 10 members of each club. St John Ambulance Victoria – we are very pleased to be able to provide defibrillators to the Victorian community with the financial support of the Hilton White Bequest. It is important to us that we can promote the benefits of defibrillators to the wider community, to encourage greater take-up of these life-saving devices and to further our goal of saving lives through First Aid. The Eureka Veterans Cycling Club predominantly races on circuits near the township of Learmonth. The ambulance response time to an incident in this area is in excess of ten minutes. In conjunction with CPR, the ideal time frame to use a defibrillator on a sudden cardiac arrest patient is within the first three minutes. The Eureka Veterans Cycling Club thanks the Hilton White Bequest and St John Ambulance Victoria for this great program. 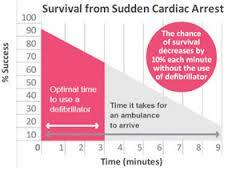 We will strive to get the message out to the community that Defibs Save Lives. 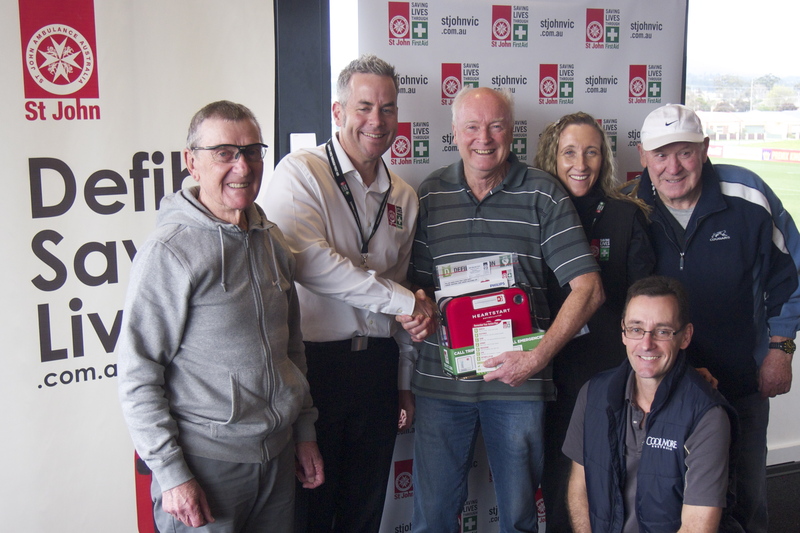 Eureka Veterans CC members receiving the defib bundle from St John Ambulance Victoria representative Martin Wells. 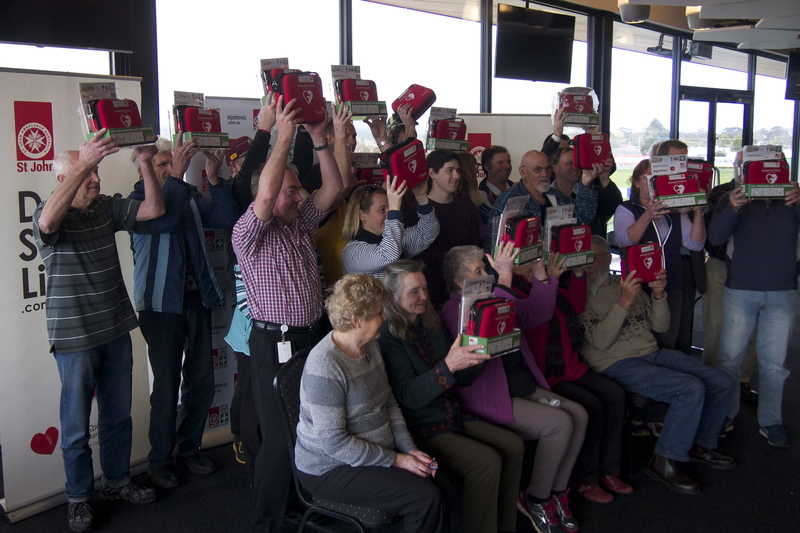 Representatives from 21 different not-for-profit clubs and organisations received defib bundles on 16th September 2015, at the Morshead Park function room, Redan, Ballarat. 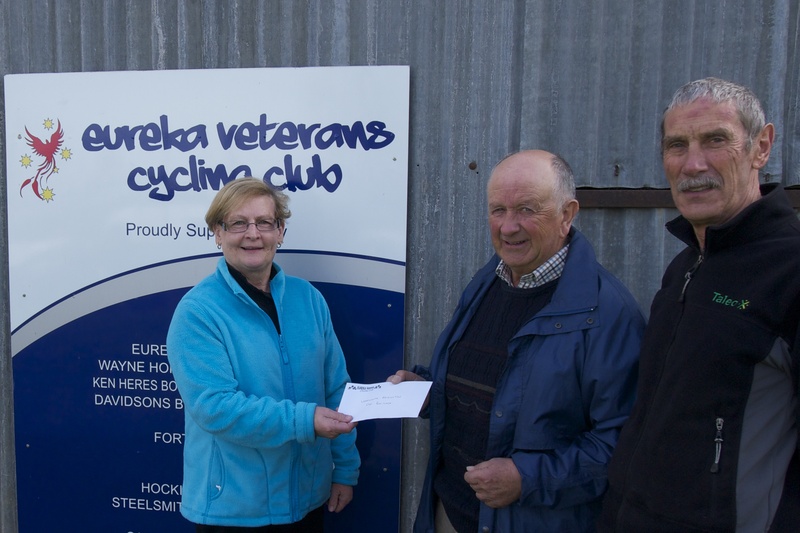 The Eureka Vets Cycling Club are proud to make a $500 donation to the local rural fire brigade. The inaugural Rising Sun Trophy (26th April, 2015) was the beginning of not only a new “classic” for the club, but also a new initiative to contribute back to the local community. Our donation consisted of the race entry fees, raffle money, individual member contributions and a club contribution to round out the total. Graham Findlay – President of the Learmonth – Addington CFA – attended the post race presentations at our next club race to receive the cheque. The Learmonth – Addington brigade covers a vast area and is manned by volunteers. In a sad irony, a dry Lake Learmonth has now increased the area the brigade has to cover. The fairy grass which has grown across the dry lake bed poses a significant fire risk to the club rooms which the Eureka Vets CC share with the Learmonth Yacht Club. Whilst the CFA provides the equipment for the brigade, many incidentals are not covered. Graham told the members that the brigade had recently purchased and built another shed to house various apparatus and equipment. This shed was built out of funds raised by the brigade. The Learmonth – Addington brigade consists of about twenty locals, many of them local farmers. The brigade proudly boasts a 100% attendance rate at emergency events in their area. At times brigade members join with other CFA members in fighting fires away from this district. On occasion the Learmonth – Addington firetruck has been required to also travel away from the district. Whenever this occurs, other local brigades such as Waubra or Miners Rest cover the Learmonth – Addington area. Likewise, the local brigade assists in covering other close by townships when their brigades are away on duty. 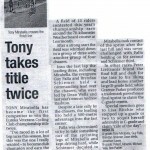 Hooray for the CFA, and thank you to all Eureka Vets members whom raced and/or made a contribution to this fundraiser. Picture: EVCC Treasurer Elaine Parker and EVCC Vice President Terry Collie present our $500 donation to Graham Findlay (President, Learmonth-Addington CFA). 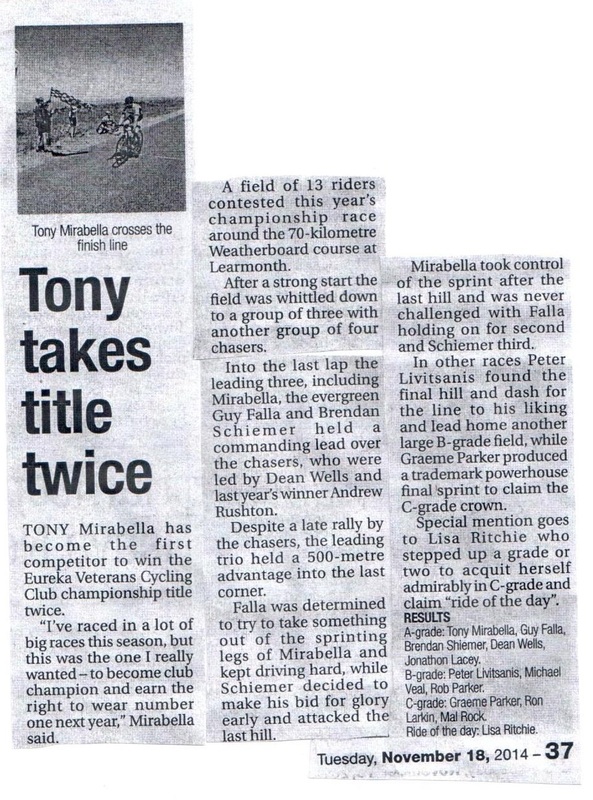 2014 Club Champion, Tony Mirabella, also took out the 2014 Club Aggregate, topping off a great year. Below is the full list of 2014 trophy awardees. Well done everyone and see you all in 2015.